One of the best parts of a trip is your home away from home. Your hotel room. Maybe it’s the clean smell, the soothing neutral colors, the bed that resembles a soft comfy cloud, or the spa-like bathroom. Whatever it is, you’ll miss it when you’re back at your real home. But this relaxed, light feeling doesn’t have to be limited to only a week or two a year when you’re away. You can easily make a few changes to your home to make daily life more enjoyable and vacation-like. 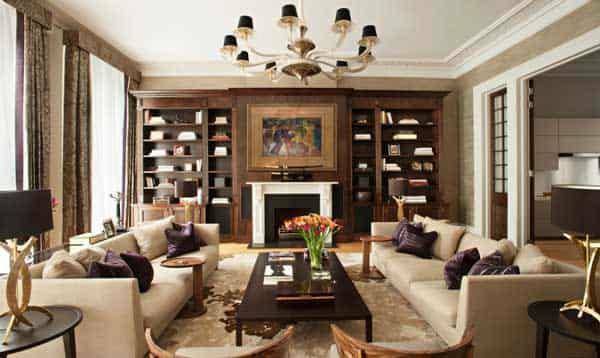 Here are 8 ways to add a touch of luxury to your life. What is the first thing you notice when you enter a hotel? Probably the well-arranged seating areas, some exotic flower arrangement, large fancy mirrors, dim lighting, and simple colorful artwork. Of course at your home you don’t have a large lobby to work with, but there are ways to make your entry-way more welcoming. Start with a small entry way table made of marble, wood, or shiny lacquer. Accessorize your table with a lamp, a bowl for knick knacks, some books, and a fresh flower arrangement (no fake flowers!). If your table is against a wall, then place a painting or statement mirror above it. 2. Bathroom or home spa? Your hotel bathroom always looks so clean and crisp that you almost don’t want to use it. You suddenly see yourself taking a warm bath (with bubbles of course), putting on a mask, and reading a book. Come on, say it with me: “ahhhhh”. At home on the other hand it’s more of a jump in jump out feeling. Let’s change that shall we? 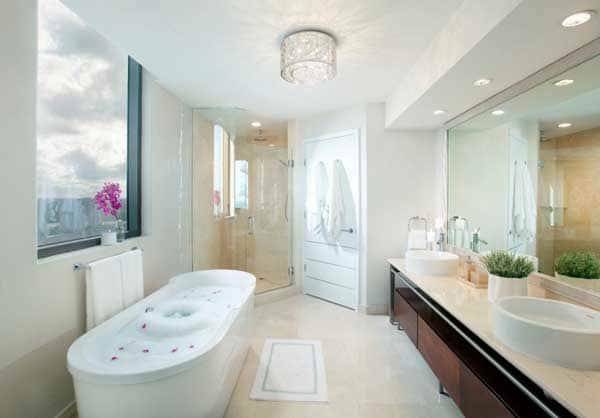 Firstly, make sure your bathroom gives the spa like feeling by using the freshest color palette: white on white. White, neatly folded matching towels (Egyptian cotton if you want to splurge), scented candles, lavender hand soap, white or light colored shower curtain, and don’t forget the matching bathroom mats. The next time you’re at a hotel, ask them if you can buy a bath robe to use at home or just buy one at your local home-store to hang by your towels. Spaces are always well-organized in a hotel. There are book cases, shelves and tables that look like they jumped out of a design magazine. There is virtually no clutter, and everything is very purposefully used. You don’t need a designer to improve the space and clutter situation in your home. Use baskets and decorative bowls to hide clutter. Shelves should be used to display collections. Side tables are for pretty vases, fresh flowers, and lamps. Adding a rug or carpet to a space also brings the entire room together. Do make sure your rugs and carpets are always clean and presentable though, to prevent odors, allergies, and embarrassments! Tips on choosing the right rug for each room can be found here. Curtains, drapes, and blinds are something many of us overlook. We hang up some wooden blinds for privacy or we buy cheap pre-made curtains at the local chain stores. We do this with good reason though. Custom drapes are expensive and difficult to find. But they are to the home as beautiful shoes are to a pretty dress. The best option is to find a seamstress that is willing to work within your budget and to buy the fabric yourself upfront. Pick fabrics that suit your tastes and fit the rest of your decor. For the luxury look, think silks, damasks, and linen as your fabrics of choice. Bonus: add black-out curtains in your bedroom for a full night’s rest, without any light gleaming in. Have your custom drapes cleaned professionally to maximize their longevity and prevent serious harm to your health. Luxury hotel rooms are typically designed in a layered manner. The main flooring is usually marble or hardwood, layered with rugs. Decorative pillows and trims are also placed expertly within the space to accent sofas and chairs. Try to use neutral colors for the main objects, such as rugs, curtains, chairs, & sofas. Hotels do this because the space needs to appeal to different people and their tastes. Accessorize the space with fun and chic pops of color with artwork, books, and vases to make it a bit more you. Housekeeping, turndown service, breakfast (in bed), or dry cleaning and laundry services are just a few of the perks of staying at a luxury hotel. While hiring a house staff to do this for you will cost you a fortune, there are less expensive ways to pamper yourself once in a while. Hire a housekeeper twice a week to keep your home tidy with Book a Tiger. Order dinner from your favorite restaurant with services such as Deliveroo or Foodora. Have your laundry and dry cleaning picked up and delivered in just a few clicks with Mr. Timesaver. Best part? Fewer dishes to wash at dinner and no more folding & ironing clothes. Need more reasons to use Mr. Timesaver? Click here. Hotel bedrooms are always well designed with matching bedding, curtains, rugs and furniture. The bed is always so inviting and resisting the urge to run over and take a plunge isn’t always easy. Yet sadly, it’s the room in our home that most of us ignore, since guests never see it anyway. But your bedroom is actually the room you should not skimp on. Start with a good mattress and layer with soft, neutral colored Egyptian cotton sheets, comforter, and plump down pillows. Your bedroom is where you rest after a long day and the first thing you see in the morning. It should look and feel like your safe haven. 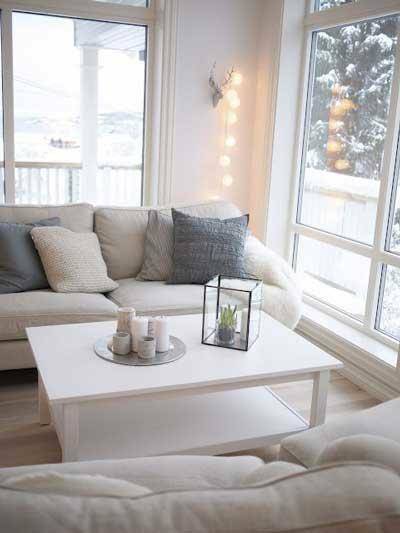 Add a side table and a side lamp, your favorite book and some scented candles. 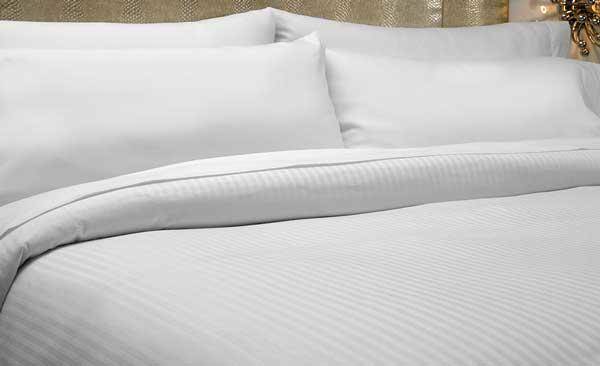 Do make sure to keep your bedding fresh and clean as hotels do, and always make your bed in the morning! Keep a few small chocolates or candy in your drawer for the occasional treat. No need to tempt yourself everyday by putting it on your pillows in the morning. Nothing makes a space come to life like fresh flowers or greenery. Luxury hotels always have beautiful flower arrangements and/or live plants in all rooms. It may be daunting and expensive to maintain a home full of fresh-cut flowers, but there are ways to attain this aesthetic without the high costs and effort. Just add some house plants such as orchids or large palm plants. If live plants aren’t really your thing, you can also add other natural elements to your home. A vase filled with spindly twigs or a glass bowl filled with acorns and potpourri isn’t uncommon. Scented candles like vanilla or lavender also add a touch of serenity to your home. Having them in every room of your house will not only create a look of luxury and romance (while showing your attention to detail and design), but will also give your home a balanced and harmonious scent.